Anyone familiar with Thai cooking knows that kaffir lime is an essential ingredient in so many recipes. 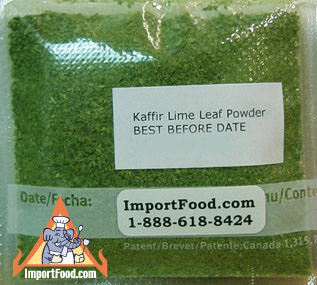 We've offered fresh kaffir lime leaves for years, and now for the first time we can offer kaffir lime leaf powder. This is fresh harvest, just picked and dried a few weeks ago. The powder retains all of the aroma and flavor of the fresh leaves. We only ship fresh new stock, chosen and packed just for us. We discovered that kaffir lime leaf powder adds wonderful flavor to all sorts of non-Thai recipes, such as bread, pasta, meatballs, it's even a very popular way of flavoring vodka. Our customers have developed the recipes below using kaffir lime leaf powder. We'd love to know what recipes you can develop also. Our 1/2 oz package is a large amount (about 2 heaping tablespoons). Just a dash of this goes a long way. Product of USA.